A view of the planned plaza alongside Center Lake. WARSAW — An agreement was entered with the Indiana Regional Development Authority and the International Economic Development Council during the Warsaw Redevelopment Commission meeting held on Monday, Aug. 7. The agreement outlines the disbursement of project funds for the upcoming Buffalo Street project. Upon completion of Buffalo Street and the associated utilities, the RDA will reimburse $969,000 to Warsaw. 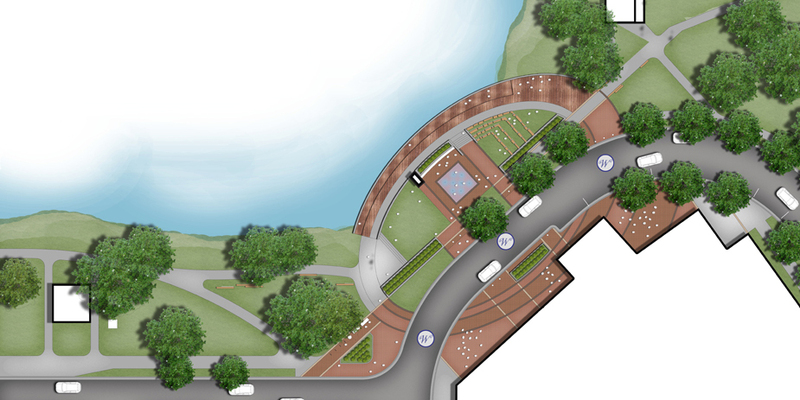 Upon completion of the public plaza, the RDA will then reimburse $646,000 to Warsaw. The reimbursed money will be returned to the budget it was originally used from and will remain in the same TIF district to be used as the commission sees fit. The agreement was presented as a draft, but the board approved it as a final agreement pending no changes to the draft. The agreement will then be presented to the RDA in September for its final approval. City Planner Jeremy Skinner stated he was hopeful the CR 300N project will be completed before school begins next week. All of the road work has been completed at this point. Crews will finish the asphalt trail, install streetlights and apply sod before the road is open back up to traffic. Seven various claims were approved by the board. Kyle Babcock was in attendance to ask if the developer has completed acquiring properties for the Buffalo Street project. Skinner replied that not all properties have been acquired but he is unaware of any issues regarding acquiring the final properties. The next meeting will be held at 4 p.m. on Monday, Sept. 11.